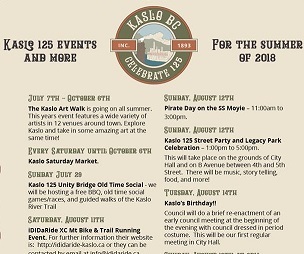 Kalso has a lot to celebrate this weekend. The town is turning 125 and a community celebration is planned. Daphne Hunter is on the organizing committee and invites everyone to Sunday’s Street Party from 1:00-5:00pm. There’s also a gala dinner and dance tomorrow night, guided heritage walking tours and Pirate Day on the SS Moyie on Sunday. It’s a great time to visit and take a step back in time, says Hunter. Click here to visit their Facebook page and to see a full schedule of events.